If the falcon is the classical bird of prey, the gyrfalcon is the king of the falcons. Although it is not necessarily faster or braver than the peregrine, it is certainly bigger and can tackle larger prey. The gyrfalcon comes in three colour phases - black, gray and white, and it is the white birds that seem the most noble in appearance. 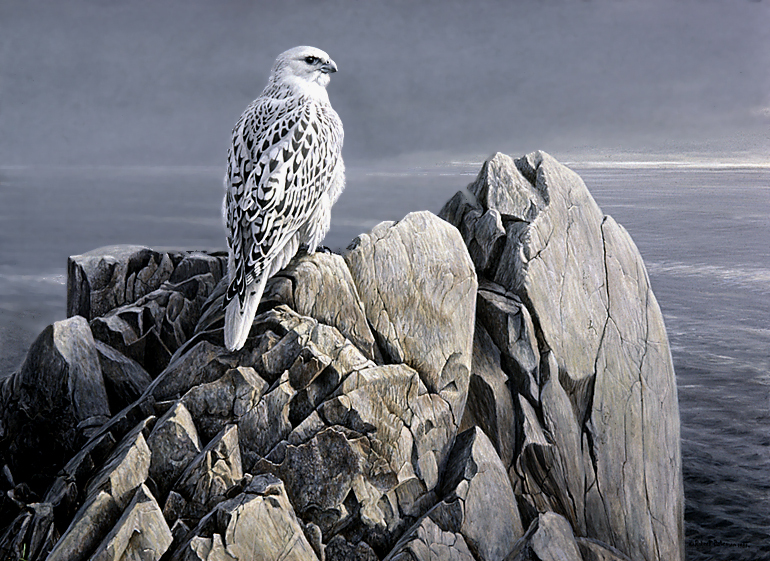 I wished to give a noble sense to this painting, so I perched him on a crag of sandstone along the Arctic coast. Like all birds of prey he has uncanny sight and likes a perch with a good view. Perhaps he is looking for a gull, which would be one of his favourite foods. The gull, who is tough and nimble himself, would be no match for the greatest falcon. The gyrfalcon is a bird of the Arctic, and the thing that I have always found particularly charming about the Arctic is the low light of the long evenings. These are the simple elements of the picture -- the sky, the sea, the rock, the bird and the light.